How Can Susie Support You? I was invited to speak at the Global Education and Skills Forum concert in Dubai recently by the Varkey Foundation, who founded the conference and the inaugural Global Teacher Prize which takes place during the event. I was lucky enough to listen to some incredible talks with teachers, educators and people from all over the world who are genuinely passionate about education. I spoke on a panel at the conference about the importance of putting PE and sport in the curriculum at school, highlighting and debating the importance of sport for mental and physical health. I was joined by Auma Obama, cricketer Brian Lara, a former finalist of the Global Teacher Prize from Germany, footballer Juan Sebastian Veron and Jerry Bamba. We had an interesting discussion covering doping in sport, lessons learned from sport and why these are so valuable for children, the difference between traditional and non-traditional sports. I emphasised to the audience how growing up, sport was not really an option for me at school in the 90s, because very often the teachers did not know what I could physically do and Paralympic sport did not have the profile it has today. Hopefully the teachers in the room will look at the importance of physical activity in schools for all children, no matter their ability. The full panel discussion can be watched here. Davos: Disability, Identity and Inclusion. Nothing is impossible. 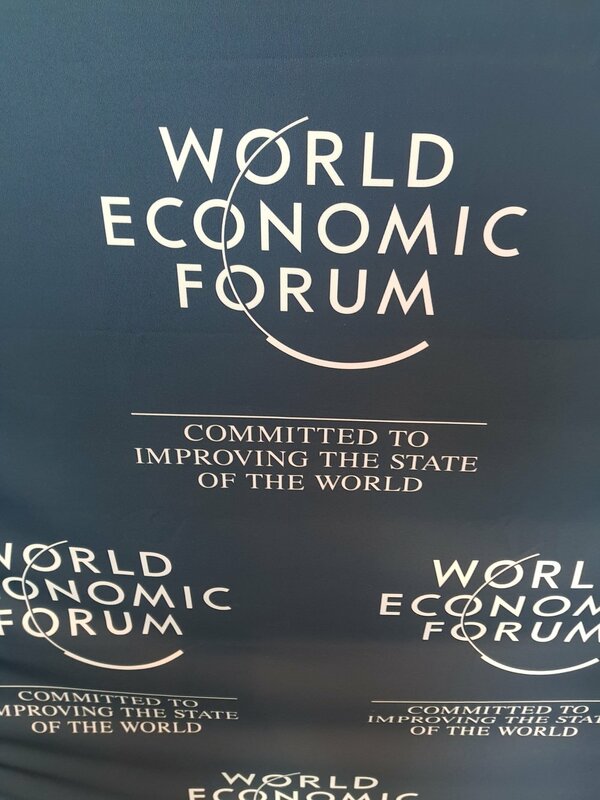 Next week I will attend my first Annual Meeting with the World Economic Forum. I am excited and honoured, to be named not only as a Young Global Leader with the Forum, but also as a Cultural Leader this year. In January 2018, I watched Davos online with great interest; following the discussions, insights, talks and updates. In 2019, I am attending and participating in some of the discussions around design, inclusion, innovation and education. This will be an opportunity for me to contribute further to disability advocacy work. I am very excited to announce that I have become an Ocean Ambassador for the Marine Conservation Society. Oceans and marine life have always been a huge part of my life. I grew up learning to swim in Egypt as a child and learning about the wonders of what lies beneath the sea. I remember travelling to the Red Sea at the weekends with my family and jumping off a boat into the water, with nothing beneath me but the big blue. It kickstarted a love of swimming that led me to Paralympic glory, but also a passion for ocean protection and conservation. I became a member of the Shark Trust when I was a teenager and avidly BBC documentaries from Sir David Attenborough and others, anything that covered oceans and seas. In fact, had I felt confident in my skills in the sciences, I was desperate to study marine biology, but other skills in languages meant I went in a different path! However, there is an opportunity now for me to support conservation efforts and education and I hope to support and add value to this global and important topic. I look forward to getting stuck in, learning and understanding about our seas in the UK and to expand and collaborate with others globally. Global awareness around climate change, plastic pollution and over-fishing has increased over the past two years, supported by the incredible Blue Planet series amongst others. There is still more to be done however and I will do all I can to protect a precious environment that I am passionate about. Finally I can share some hugely exciting news that I have had to keep to myself for several months. I have been selected after a year long process, nomination, application and interview, by the World Economic Forum to be a Young Global Leader for the Class of 2018. I first found out about the WEF and the YGL programme after the Rio 2016 Paralympic Games. I was travelling in Australia and China after the end of my swimming career, retiring at the top of my sport. I attended a lunch in China and fate led me to meet Carol Li Rafferty, who listened to my speech about my journey not just as an athlete, but my work at the British Council, my love of cultural relations and languages from University, my work in education and sitting on charity and sports boards and working in welfare and safeguarding. She came up to me afterwards and said she was a YGL and would love to nominate me for the Class of 2018. This was back in December 2016. I researched the YGL group and could not believe the incredible list of current members but also the extensive and impressive list of alumni. We spoke over email for several months and she very kindly submitted my application. It was a touching moment at a point where in my transition as an athlete, I felt lost, doubted my abilities and completely alone, having left the elite sport community with no real links. Carol believed in me and gave me the courage to put myself forward for this opportunity. I carried on with my life, changed jobs, announced my retirement from sport and did not think I would be short-listed given the strength of the field of nominations and the fact that there are only a small number of leaders selected across the world. So, when I received further requests to fill out an application form, I was very excited, but naturally tried to manage my expectations. For the final stage, I was selected for an interview and met a YGL alumnus. It didn't feel like an interview but was in fact a fascinating conversation with a very interesting person. If nothing else had come from my nomination, I genuinely enjoyed meeting Tom that day! Fast forward to now as I announce my selection onto the programme 18 months after meeting Carol, I honestly don't think I have felt so proud since winning my Gold medal. This achievement felt even better and even more exciting. And so, it is with great excitement that I met a few YGLs in my cohort at the Welcome Event recently at the WEF headquarters and we had the honour of listening to Professor Schwab discuss how he founded the Forum. An unbelievable moment. I loved meeting my fellow YGLs and knowing that I will get to work, support and collaborate with them potentially in the future. I cannot wait to get started and I am so happy that I am connected to an organisation and group of people that believe in me and each other and believe in working together for the better. I will endeavour to support and help nurture such a fantastic and diverse community. A very exciting day for me on Tuesday this week and another pinch me moment, when I witnessed the launch of Zoggs' Ecolast™ swimwear collection at their international conference in London. I have partnered with Zoggs now since 2016 as their Brand Ambassador, initially as an elite athlete but also now through to my retirement from competitive sport last year. My transition from elite sport has involved adapting to a new identity and rediscovering my passion for swimming in a different way. I have started swimming outdoors as a result, finding my passion again for the underwater world and connecting with why I started swimming in the first place - because I enjoy it and through my love of the Ocean. I remember whilst growing up in Egypt as a child, my first swimming experiences involved jumping into the beautiful vast blue of the Red Sea. I learnt to swim in Egypt as a 6 year old and my fascination with the underwater world and especially sharks, started during this time! The thrill of jumping into the sea and seeing nothing beneath me, I found completely exhilarating and still do. So, when Zoggs let me know that they were creating a sustainable swimwear line, made from yarn that is produced from discarded ghost fishing nets, old carpet and plastic debris recovered from the seas around Europe, I was so proud to be a part of their launch and supporting the Ecolast™ products. They are due to officially launch the products from July this year and Zoggs have made a pledge to reduce their packaging and increase the amount of their line that use this specially created yarn over the next few years. So, I decided to join their pledge and have said that I will only wear the Ecolast™ products from now on when I swim! There is something wonderfully poetic about swimming in the Ocean in a costume that is produced from recycled waste recovered from there. They also pledge to reinvest some of the profit back into the companies that retrieve the nets from the water. I was lucky enough to get to try one of the costumes the next day in my swimming session. They look good, feel good and do good! This is why I am hugely proud to continue to work with Zoggs as their Ambassador, as they continue to lead and pioneer the way in being a sustainable company with a higher purpose. Congratulations Zoggs on your forthcoming launch! Once again I was extremely lucky to be invited to the annual London Sports Awards. This time I was a judge on the panel selecting the winners across grassroots sports categories including the workforce award, volunteer of the year, club of the year and many others. It really was a tough job to decide between so many deserving applications. Sport in London is going from strength to strength, bringing communities together, getting people active and showing the value of sport in improving social connectedness. I met many people at the start of my swimming career, before I was a funded athlete competing internationally. Sport was my way to manage my stress levels and it quickly became a social activity more than anything else. I treasure the friendships that I have made in the pool which continue to this day. The medals and the wins are not the whole picture. The friendships and the journey, the volunteers that sacrifice their time to help others, those are the people that equally deserve praise. I still owe a huge amount to my coaches, including Keith Morgan at Crystal Palace weightlifting gym. He coached me to six Paralympic medals and did so voluntarily. It is people like him who are the heartbeat of sport and hopefully some of the winners at the recent London Sports Awards will feel that their hard work has been recognised. To all those who did not win, you deserve just as much praise for all the work you do. Keep it up and remember that everything you do is valuable. Sometimes opportunities come your way that you cannot help but be amazed by. I was asked by the Mayor of London's office at the end of last year to be a part of his gender equality campaign, celebrating the centenary in 2018 of the first women's votes. I felt extremely humbled to be asked and very proud of the video that launched on social media, just as we turned the corner between 2017 and 2018. Gender equality became a hot topic last year as a number of high profile cases appeared in the media across a variety of public and private sectors. I hope that this video highlights not an "us and them" attitude to gender but rather a collaboration towards common goals, equality, team work and visibility for all. This could also be applied to any minority grouping. Something I feel particularly strongly about is disability and the importance of value for disabled people and their contribution to society. As with most people, my 2017 has been filled with ups and downs both professionally, personally and privately. However, I hope we all move forwards with optimism, learning from past experiences and hoping to leave a positive impact on the world and each other. Sometimes opportunities come up and you cannot believe your own luck. As an Ambassador for Samsung, I was invited by them to attend the UK delegation heading to South Korea as part of the Olympic Torch Relay for the 2018 Winter Olympic Games in PyeongChang. Our itinerary looked jam packed; fly to Tokyo, then on to Busan in the southern part of South Korea. It would take over 15 hours to get there and jump us forward by 9 hours ahead of GMT. We were due to stay for two days then return home. It seemed a mammoth journey, but it was absolutely worth every bit of jet lag and the hours of travel. We arrived on Friday evening in Busan, a mass of Samsung volunteers and employees greeted us at the airport. The cameras were ready and we soon forgot our fatigue as we were whisked off to our hotel on the beautiful Pacific coastline of the East Sea. I was very excited to visit a very different part of the world and one which I am not familiar with, but upon arrival I was struck by the generosity, smiles and sense of humour from the staff we met there. The first day involved visiting a beautiful and peaceful Buddhist temple, the Beomeosa Temple, set in the idyllic autumnal, leafy hills that surround Busan. We were shown how to brew a traditional Korean green tea for guests. It takes a lot of care and attention that requires at least ten minutes' preparation compared to our standard and quick builders tea! We then swiftly moved from our lunch to the Gukje Market which gave us a fascinating insight into traditional Korean culture. We could observe how ladies cook kimchi and the variety of seafood on offer (including entire dried squid and other interesting delicacies). After a cable car trip spanning the stunning coastline of Busan, we headed to a traditional Korean BBQ dinner. During the whole day we wanted for nothing and were given amazing insight into Korean history and tradition by our energetic and witty guide, Genie. The following day, my fellow athletes (Ellie Simmonds and Amy Williams) and I got up at the crack of dawn to travel to a secret organising committee venue to get kitted out for our turn as torch bearers on the historic Olympic torch's journey to the heart of the Winter Olympic Games in PyeongChang next year. I must admit we all felt nervous and once we had done various kit swaps, we waited patiently to be called up for our turn to walk or run the 200m slot we were allocated. I chose to walk my 200m and tried to take in the magic of that moment. It is an indescribable feeling, having been to two Games and won medals, to be a tiny part of a journey that will lead athletes to the podium next year in PyeongChang. In fact, there were two Winter Games hopefuls with us; Rowan Cheshire and Jamie Nicholls. I talked to them about their preparations and feelings ahead of next year and it made me reminisce about the pure wonder and magic of competing for your country on such a global stage. Nothing can ever replace the feeling of competing, winning and then standing singing your national anthem with a Gold medal around your neck. That realisation that you did it and that every tough moment you went through, every failure, every set back was all part of the plan and process. I still get goose bumps even a year later and hope it never stops. I carried my Gold medal in my pocket as I walked with the torch, it has travelled around the world with me this past year and still accompanies my various trips! All I can say to those competing at the Winter Olympic and Paralympic Games in PyeongChang in 2018 is please, please relax and enjoy every minute. You have done the work by now, you are ready, be confident and remember to take in every part of it. We will all be cheering and watching you from home! Especially to Rowan and Jamie - I am so glad I know some athletes and I will be screaming for you! Finally, I want to thank the team at M&C Saatchi and to Samsung for being a great sponsor. I am proud to support you as an Ambassador and so grateful for all the support and friendship that you have given me since filming "School of Rio" last year until now! Thanks to all the South Korean Samsung staff who were so attentive and to all my fellow torch bearers I met over the last few whirlwind days. I knew after Rio that I could be ready to step away from competitive sport, but I needed a few months to think things over and to use some time to come to a decision. I want to leave at the top – undefeated European Champion over 6 years and Paralympic champion in the 50m Butterfly at Rio 2016. From fourth in London, to Gold in Rio, it was a journey of learning, challenges and ultimately immense happiness. Being awarded an MBE recently in the New Year’s honours was a final perfect way to round off 8 years at the top. I leave the sport with 30 international medals and I am proud of my swimming career. It is time for me to step away and to allow other areas of my life to develop as I am getting involved more and more with external projects. I always knew that the day would come when I would want to move on and to return to developing myself into a future leader and to use the other professional skills that I have developed alongside competing as an elite athlete. I feel honoured to have represented my country, to have made it to the top of the podium many times and lucky to have raced against the best. I wish them and the rest of the Paralympic movement huge amounts of luck and success in the future, I really believe strongly in the Paralympics and everything it represents and I hope to remain involved in sport for years to come. I want to thank the people I have met, the coaches and staff that I have worked with and the incredible people I have raced against over the years. I will miss the incredible moments with my lovely team mates, but I will never forget the amazing memories that we shared. I will never stop swimming; I love it too much, but for now, my racing days are over. Thank you to my family and friends who have supported me and to Steve Bratt, Ron Philpot and Terry Smith at the start of my career and Tony Beckley at the end for all their help. And to Keith Morgan, who has trained me in the gym since day one. I won't forget Friday 17th February any time soon... I got ready in the morning in my flat and put on my outfit and most importantly, my hat, and headed to the Mall with my Mother as I prepared to receive my MBE for services to Para Swimming at Buckingham Palace. I was very excited but nervous when I arrived. I always find it strange when you are allowed to walk through the Gates and the crowds are watching you and taking photos! It is a surreal experience. It was lovely to see some of the Hockey ladies there too; Kate and Helen Richardson Walsh, as well as some of my Para swimming team mates again. We nervously were ushered into a separate room upstairs and talked through the protocol along with the other guests. Trying to remember what you have to do is possibly the hardest part, along with how to address the Royal family! The Prince of Wales was awarding the honours today which made it extremely special for all the attendees. As I waited for my surname to walk out, I looked around the Ball Room (I have never been upstairs in the Palace before although I have been a few times now!) and took in the beautiful music played by the Orchestra as I came out (it was Coldplay "When I ruled the World" I think it is called!). It was a magical moment, over so quickly but a wonderful feeling to have recognition from my years of competing and working hard from the bottom to the very top. The Prince of Wales spoke briefly to me about my medal haul and how long I have been swimming for and in a brief moment it was over, just like my win in Rio. There are some wonderful moments in life and they are so fleeting, but you value them more because of that. I was lucky to be there today and to share it with some of the people that have been a part of my journey, because I didn't do it alone. So I guess I want to say thank you. To everyone who helped me to get there and along the way. Here's to the next Chapter!